The original Long Pond water treatment facility, known as the Long Pond Pumping Station, was built in 1898 and is listed on the National Register of Historic Places. Long Pond was the Town’s most reliable source of water and the Pumping Station was its first municipal pumping station. It played a vital role in sustaining the Town’s economy and growth for over 100 years by providing clean, potable drinking water. It stands as an important landmark for people using the walking and running trails around the Long Pond Reservoir. By 2006 it was one of the few remaining operational facilities of its kind nationwide, but it was also badly deteriorating and in need of repair and restoration. 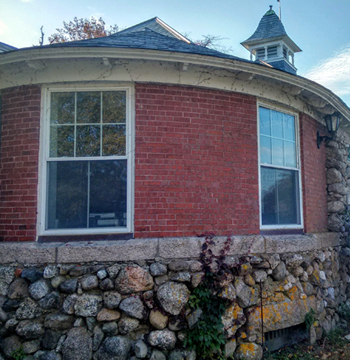 In 2003 the Town authorized borrowing $1,206,000 for restoring the Long Pond Pumping Station (Phase I) and appropriated $300,000 in 2006 for additional structural repairs (Phase II). Total cost was $1.87 million, and in 2006 the Town applied to and received from the CPFund $370,000 for completion of the restoration in a historically appropriate manner. Work included repairs and repointing of the brick inside and out, replacement of the louvers, restoration and replacement of existing windows, repairs to the stone foundation, replacement of the bulkhead foundation, restoration or replacement of wood trim, restoration and replacement of interior doors, and insulation of the basement. The work was completed in 2009. The building continues to serve as offices for the Water Department and the Department of Natural Resources. By the time the new water treatment facility is operational in the spring of 2017, stakeholders will have agreed on the best continued use of the pumping station building.